For those with hearing impairments, sign language is an essential part of their lives—without sign language, communicating effectively would be incredibly difficult. Those without hearing impairments (and without contact to those with hearing impairments) are often not versed in sign language and this can lead to some obstacles when trying to communicate with a person who is hearing impaired. In addition to this, sign language can be beneficial in raising children, even those without hearing impairments! In her book, Simple Signing with Young Children, Revised Edition, Carol Garboden Murray examines the benefits of sign language for all people. In the revised edition, Garboden Murray examines how sign language can be used by educators and child-care specialists to enhance the classroom experience. The use of sign language allows for the classroom to have a shared language, while also allowing easier communication to occur for children who have not yet learned to speak, or have speaking impairments. Garboden Murray provides an easy-to-use book that captures the very essence of sign language— like all other communication, it can be fun! Babies and toddlers who sign typically have larger vocabularies in preschool and kindergarten than babies and toddlers who never learn to sign. Babies and toddlers who might otherwise only be able to grunt, point, or cry to show their needs learn that signing can replace frustration with successful communication. ASL is the third-most commonly used language in the United States. Sign language helps teachers manage classrooms and develop an awareness to the sounds of the classroom. With sign language, visual learners can see language, and tactile learners can feel and touch words. As well as reaching children with special needs, creating an inclusive classroom means finding ways to make learning accessible to children who speak other languages at home. The empowerment that comes early from successful communication helps children develop internal resources and confidence. Communication is foundational literacy. Signing enriches vocabulary and language skills. Signs improve responsive communication, eye contact, and attention between adults and children. 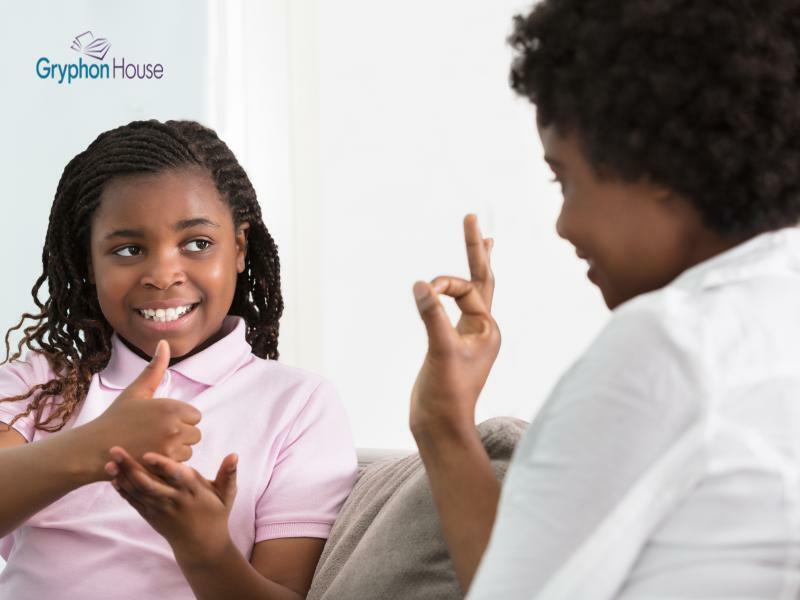 Sign language is a natural and elegant way to make connections, communicate, and develop stronger relationships with the children you teach. Helpful Tips for Teaching Children ASL! When you introduce signing to the classroom start with one or two signs and make them appropriate to classroom procedures. Use the enthusiasm of the classroom to gauge how many signs you teach in the next lesson. Continue to practice the sign from the lesson throughout the day. Facial expressions are a very important element of ASL. American Sign Language is more than handshapes, so have fun! Have several resources to use in the classroom such as an ASL dictionary and teacher guides such as Simple Signing with Young Children, Revised Edition.